Website performance analysis tool is capable to monitors and alert against all web server related error likes website is down, inaccessible or unavailable due to Low Bandwidth, low connectivity network status or Connection Failed etc similar message. Software constantly keeps an eye on your website's performance and inform to you in one of the following way that is send email at user specified email id, run any specified program or set alarm sound. Website performance checker tool is compatible with all ISP (internet service provider) based internet protocols such as FTP, HTTP, HTTPS, POP3 and SMTP. Program always provides current status of online website including some other important details such as website monitoring method, used port number, header/server info etc. Website uptime monitoring tool provides an easiest way for checking multiple website performance without wasting time as well as money on several time taken web sites monitoring services. Application provides an interactive GUI based interface which provides complete detail view of selected website performance and also check availability of selected web link on different internet service provider. Web site performance tool takes only few minutes for observing single or multiple web domain performance and availability and immediately inform to user if any link found inaccessible. * Web site performance checker software always monitors websites' uptime, downtime with online status and server error message such as low connectivity network status, server not found, connection failed etc. * Website downtime analyzer is compatible with all types internet service protocols likes POP3, HTTP, SMTP and FTP. 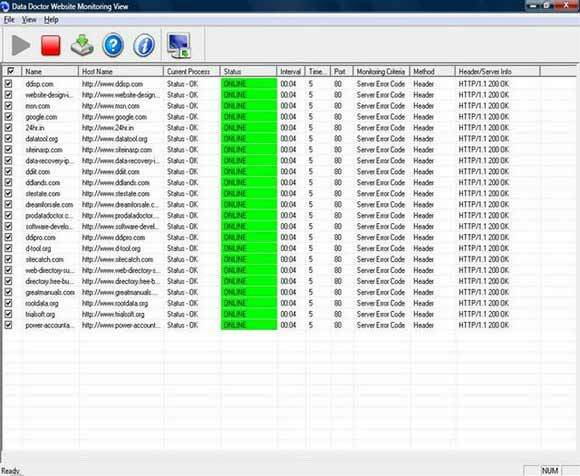 * Web site performance monitoring tool supports all windows operating system including windows XP, NT, 98, 2003 server, 2000, ME and Vista. * Website status tracker program immediately inform to user by launching any program, beep a sound or send email to specified email id.